The Why Files | 1. Stem cell update! Embryonic stem cells, the do-anything cells that appear in the embryo a few days after fertilization, are the ancestor of every cell in your body, and so could be the basis for regenerative medicine, the quest to replace or restore defective, aging or diseased tissues. A human heart cell derived from an iPS cell was labeled to identify proteins that allow muscles to contract. 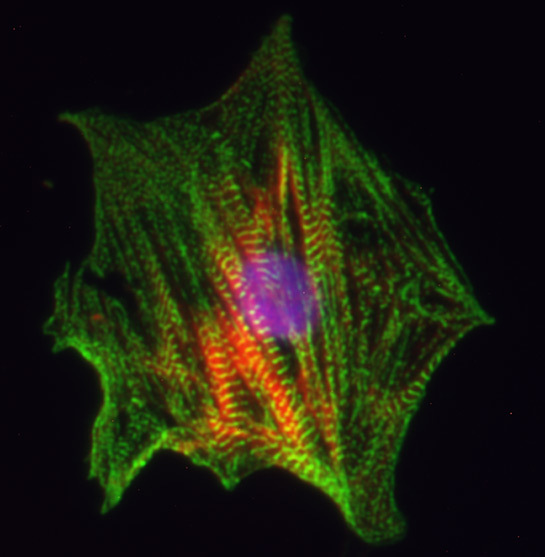 Green shows alpha-actinin; red shows myosin light chain 2a; cell nucleus is blue. ES cells may treat grievous conditions like diabetes, Parkinson's and spinal cord injury. This healing potential has sparked interest among patient groups, whose push for faster progress is reminiscent of the early years of the AIDS epidemic. ES cells are ethically tainted because they require the destruction of a human embryo, the tiny ball of cells that can grow into a person. This attitude has spawned laws that restrict federal funding to research on a few lineages of ES cells, forcing researchers to wade through extra paperwork and buy duplicate equipment to do ES work. In response, some states are funding ES-cell research. California's $3-billion stem-cell initiative has transformed the scientific landscape by inducing many researchers, including Thomson, to open labs there to gain state funding. 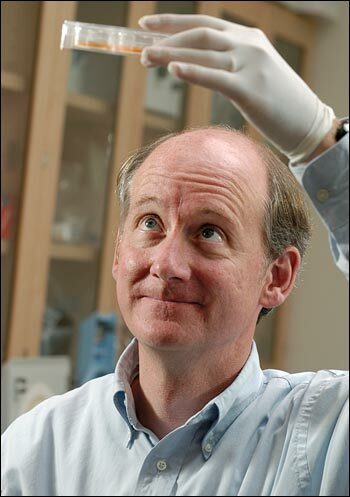 Developmental biologist James Thomson, viewing a stem cell culture at the University of Wisconsin-Madison, reported the first isolation of embryonic stem cell lines from a nonhuman primate in 1995, and the first isolation of human ES cells in 1998. In 2007, Thomson and a group in Japan reported that they had reprogrammed skin cells to create induced pluripotent stem (iPS) cells, which look and act like ES cells. The field of stem cells has broadened considerably since the discovery of embryonic stem cells 10 years ago. The most dramatic discovery occurred last year, when two research teams produced the poly-jargonically enhanced "induced pluripotent stem" cells. iPS cells have many similarities to ES cells, but because they do not require human eggs or embryos, they evade the political tussle and funding limits that surround ES cell research. iPS cells: Embryonic stem cells without the embryo? The first iPS cells were made by placing four genes in a skin cell, changing it into a cell that could produce virtually all cell types. The genetic change caused the cells to behave, in other words, like an embryonic stem cell. Because some of the transferred genes can cause cancer, the original iPS cells will not be the basis for any treatment. This September, however, researchers at the Harvard Stem Cell Institute made mouse iPS cells without inserting the cancer genes into the cell nucleus, reducing the cancer concerns. iPS cells quickly found a role in basic medical research, because it is now possible to take a cell from a patient, convert it into a stem cell, and produce specialized cell carrying genes for the patient's disease. 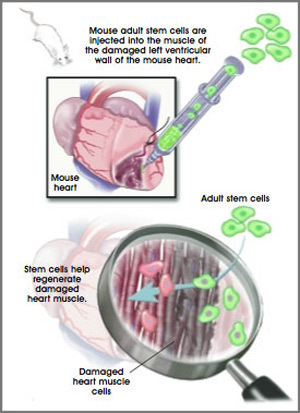 Human embryonic stem cells can be differentiated into any cell type in the adult body, and are possible source of cells for heart repair cells, or testing how new drugs affect the heart. In August, scientists at the Harvard Stem Cell Institute reported using iPS cells as the source for 20 types of stem cells that represented such diseases as muscular dystrophy, type 1 diabetes and Parkinson's. "We wanted to produce a large number of disease models for ourselves, our collaborators, and the stem cell research community to accelerate research," researcher George Daley said in a press release. "Our work is just the beginning for studying thousands of diseases in a Petri dish." iPS cells have so many advantages that they could make ES cells obsolete, but stem-cell pioneer Thomson says it's too soon to be sure. "I personally believe the future is in these iPS cells, but the future isn't quite here today," Thomson said, as reported by Rick Weiss. "If they're identical to embryonic stem cells, then everything we're doing with embryonic stem cells today will apply directly to these new stem cell lines. If they're fatally flawed in some way ... then everything we're doing with embryonic stem cells will apply to embryonic stem cells and we won't waste any time." A third variety of stem cell, the adult stem cell, can form fewer varieties of daughter cells than ES or iPS cells. Adult stem cells have long been used to treat blood cancers through bone-marrow transplants. In a report from last June, bone-marrow cells were used to treat epidermolysis bullosa, a rare and fatal genetic deficiency in the skin and intestines. "It was extraordinary," John Wagner, a hematologist-oncologist at the University of Minnesota told the World Stem Cell Summit. "We used a bone marrow [stem cell] subpopulation and effected a cure with a specific cell line that resulted in success for a few patients. We were not prepared for success. As scientists we always think about how to overcome the next obstacle." Adult stem cells occur in many tissues, and can be differentiated to form a variety of specialized cell types. 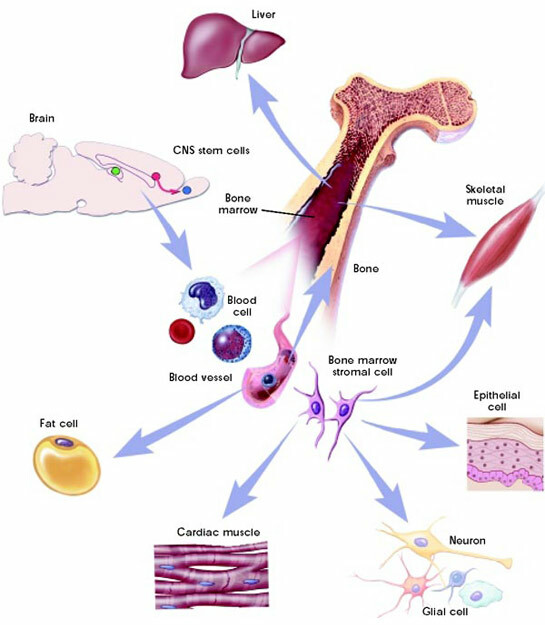 Bone marrow transplants are, in essence, a transplant of adult stem cells from the bone marrow or blood. The summit, held in Madison, Wis., in September, was a good place to appreciate the growing complexity of stem cell research, as scientists, businesses and patients, many in wheelchairs after spinal-cord injuries, discussed how to accelerate studies, move treatments to the clinic, and make some money. One symbol of stem cells' newfound legitimacy was the presence of John McNeish, executive director of regenerative medicine at big-pharma big-dog Pfizer, who said, "Stem cell technology is at or approaching the tipping point, where it will bring cures to the patient." Stem cells are already playing a lower-key role in medicine, as McNeish added, by producing mature cells for testing drugs. McNeish ,said that 10 to 16 percent of all candidate drugs are rejected because they impair heart rhythms, and that Pfizer has found that heart cells grown from mouse ES cells contract rhythmically and respond normally to drugs that affect the heart. Testing such heart cells may offer a shortcut for screening out drugs that harm the heart, saving time and development costs, McNeish said. Stem cells also have a role in exploring the cause of disease. An absence of cells that make dopamine causes Parkinson's disease, and UW-Madison stem cell researcher Clive Svendsen says that now that scientists can make these cells in the lab, "I'd be extremely shocked ... if scientists don't understand why Parkinson's happens in the first place, and develop therapies that don't have anything to do with stem-cell transplants." Making specific cell types on demand. Despite considerable progress, stem-cell biology is subtle, and it's not always clear how to produce healthy specialized cells. Solving safety concerns. A stem-cell treatment for type 1 diabetes would transplant cells that produce insulin into the pancreas, which seems like a great improvement. But, Svendsen says, "if we introduce pancreatic cancer, you die in three to six months." Controlling a disease process that originally killed cells in the patient. Type 1 diabetes is probably caused by an immune attack, which could also destroy transplanted cells that produce insulin. Preventing immune rejection of transplanted cells (which can be attacked like any other foreign body). The chances for success would be greater if the patient's own cells are converted into stem cells, using the new iPS technique, and then into specialized cells. Integrating the transplanted cells in a useful way. Some cases (think blood cells) will be much easier than others, like brain cells. With almost no stem cell treatments available in the United States, many patients are traveling the globe for treatment. How does this work?